As requested by Twitter here it is. A nice heartwarming soup recipe. This is my salmon soup, its perfect for cold days, and its also very easy to make. It looks good and it tastes oh so yummy. 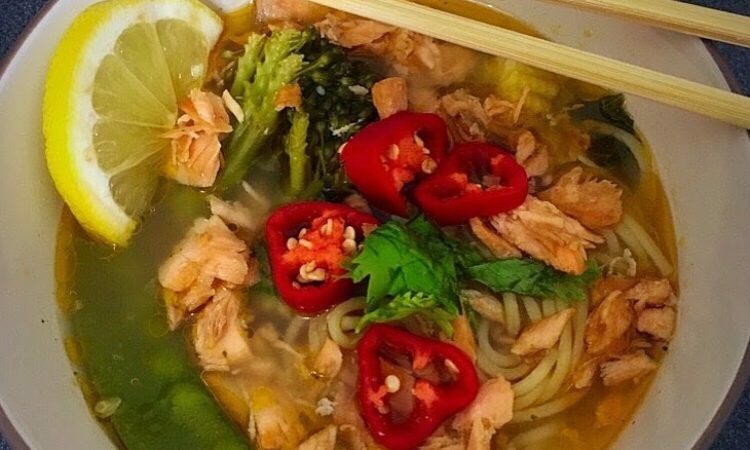 I came up with this recipe after falling in love with Wasabi’s salmon Teryaky soumen and I thought “why can’t I add salmon to soup at home?”. I’ll admit at first I was very worried that it would not work but I knew that I had to at least try it. Mix the soy sauce with a pinch of brown sugar and pan fry the salmon with it. Once the salmon is cooked through break it up using a wooden spoon, break up the whole thing until you have flakes or small chunks. Keep it on the heat while you do this, it will start crisping up at the edges. Once the edges have crisped up take it off the heat. In a large pot heat up a tablespoon of olive oil with minced garlic, chilli flakes and ginger paste, saute the spring onions, mushroom, baby corn, broccoli and mangetout and mix it all with the tomato concentrate. Once they are cooked through (10-12mins) gently add in your stock and a wedge of lemon and let it simmer. Season with salt and pepper and fresh coriander. Cook your rice noodles as per the instructions on the packet and add them in along with half of the salmon. Let it simmer for a few minutes. Garnish with fresh chillies, the rest of the salmon, the leftover slices of lemon and fresh coriander. Serve hot and let it warm you through. I love that you used salmon in this soup!! This looks really tasty, thanks for sharing!